We believe that there is amazing beauty in all of the different species of wood. That is why we do our best to bring out the natural beauty with the way that we design, build and protect what we make. Our products are also designed to seamlessly blend into any home décor. We hope you love them! Whether live edge, straight edge, mahogany, walnut, maple, metal hairpin legs or x-crossed wooden legs, we can get it or make it for you! Different colors, styles and hands. Whatever clock you may want we have it or can make it! Want a custom clock? Let us know! 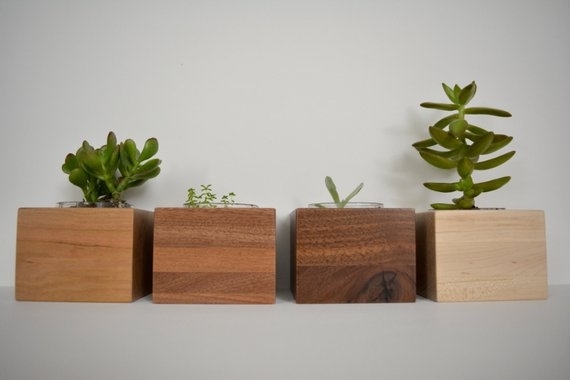 Planters are a great way to bring a little bit of green to any space. We have a large variety of styles and colors available so check out what we have.